"This is a recipe that we have made in our family for many years--everyone loves it. It's a very basic and easy variation on mac 'n cheese." Bring a large pot of lightly salted water to a boil. Cook spaghetti in the boiling water, stirring occasionally until tender yet firm to the bite, about 10 minutes. Scoop out some of the cooking water and reserve. Drain spaghetti. Heat oil in a large skillet over medium heat. Add garlic and pepper; cook and stir until fragrant, 1 to 2 minutes. Add spaghetti and Pecorino Romano cheese. Ladle in 1/2 cup of reserved cooking water; stir until cheese is melted, about 1 minute. Add more cooking water until sauce coats spaghetti, about 1 minute more. 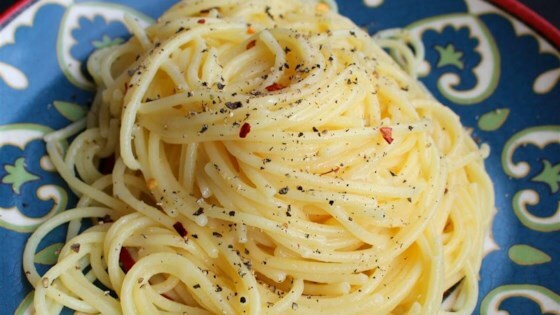 Pasta in a simple but tasty sauce. Substitute butter for the olive oil if preferred. For a thicker or thinner sauce, adjust how much pasta water you add. If you add too much water, add some more cheese. I have added other ingredients depending on my main dish to enhance flavors (like pancetta); I always experiment when creating food. I made a huge mistake when I made this. I made it with thin wheat spaghetti. I should have used regular so unless you want a mucky mess, use regular spaghetti. Super simple and quick to make! If you're a college student like I am, this is a thousand times better than ramen! I just added a pinch or two of red pepper flakes to add some heat and voíla!